So, I appear to be having another period where I can't draw. What a terrible month for me to declare an intent to do 30. Well, I'll make it up one day when I get the knack back. At any rate today I have the letter J, with a Serif because Sans Serif seemed like too lazy of a way to do it. 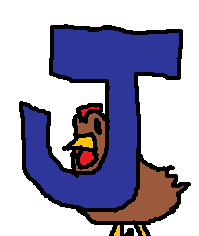 It's just the letter J with a chicken poking up over it. Really one of my less stellar works I must admit.